The closing rally of Socialism 2008, hosted by the Campaign for a New Workers' Party (CNWP), was on the theme of the fight for a working class political voice. Chairing the rally was Save Huddersfield NHS Kirklees councillor Jackie Grunsell. The first speaker, chair of the CNWP and Socialist Party councillor Dave Nellist, highlighted the damaging legacy of eleven years of New Labour's big business agenda - wars, unemployment, economic insecurity and a massive wealth gap. Dave attacked the return of sleazy Peter Mandelson as a government business minister. He referred to Mandelson on his appointment as effectively saying: 'I want to start where I left off - with the privatisation of the Post Office'. Dave demanded that the trade unions, who have funded New Labour that in return attacks pay and conditions, end their political affiliation. Kevin Ovenden, a national leader of Respect, congratulated the Socialism 2008 organisers for their prescience in advertising the event with the subhead 'Marx was right' in advance of the current financial crisis! He spoke about the victims of this capitalist crisis, pointing out the extreme levels of poverty in inner city areas like Tower Hamlets where Respect has elected councillors and the MP George Galloway. He said that Respect, which emerged from the anti-Iraq war movement, has had a difficult year because of its split with the SWP faction and recognised that Respect is not the 'finished article' in terms of working-class political representation. Comedian and socialist Mark Steel started by saying that the biggest enemy on the left was cynicism - that the world can't be changed. But, following the election of Barack Obama, everyone believes it can - even reactionaries like George Bush! 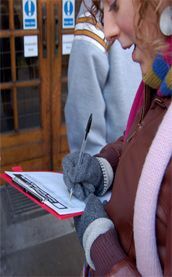 Mark went on to criticise what he considered to be the failure of the socialist left - its failure to embrace small campaigning groups and propensity to "squabble". Unfortunately, Mark Serwotka, general secretary of the PCS civil servants' union was too ill to attend. Hannah Sell, deputy general secretary of the Socialist Party, said one of the main obstacles to convincing broader layers to subscribe to the idea of building a new party and fighting for socialism is summed up by sympathetic people we meet who say "But can you really change anything?" Of course, the massive events of the last few weeks have radically changed people's political consciousness, namely, the crisis in capitalism and Obama's victory. Hannah contrasted the government's �500 billion bank bailout with the union pay demands of all public sector workers which amount to only �5 billion - which the government says it cannot afford. On the question of disagreements on the left, Hannah emphasised that striving for unity is very important but that in the course of this socialists must learn the lessons of previous failures to build new workers' parties to avoid repeating the same mistakes. On the question of a new workers' party, the left trade union leaders have a vital role to play. 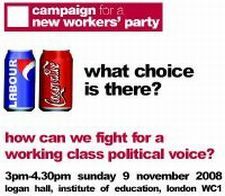 They can begin by calling a conference of trade unionists to discuss the need for workers' political representation. Hannah concluded by saying: "the wave of capitalist triumphalism of the last 20 years has ended. We're now entering a new period in history where the ideas of Marxism will be embraced by mass movements of the working class." Videos of this discussion forum are being hosted on the Socialist Party's website and can be viewed here.